I made this cake for a bridal shower for a bride who loves – you guessed it – sunflowers! There are so many different techniques out there for making sunflowers, but I couldn’t seem to get them to look the way I wanted. I had plenty of sunflowers with petals falling off looking more like a Frankenstein monster with wire sticking out at every angle than a delicate flower. What I have outlined below is what worked for me. And I hope you like it and find it as easy to make as I did. I started with the center of the sunflowers. I used chocolate fondant, but you could also use regular fondant and color it brown. First, create a ball of fondant. This ball is about the same diameter as a quarter, or about 1 tablespoon of fondant. Even if you are making multiple sunflowers, the exact amount doesn’t matter. Every flower is different, so let your flowers be unique as well! Next, take a metal strainer and press the ball into the strainer. The goal is to flatten the ball as you press it. Make sure you press the edges into the strainer as well. You will get a textured effect and a perfectly domed flower center. I tried other techniques, like using a piping tip, to texture the flower centers and none of them worked as well as the strainer. Make all of your centers before moving on to the petals. You will thank me later! Put the sunflower centers aside for now. I used pre-colored Fondant. For such a bright yellow, it is far easier to buy the pre-colored variety! Using the Wilton large daisy cutter, or something similar, roll out and cut out yellow flowers. Next shape your flower petals. I started by using the ball tool and shaping the petal from the inside out, flattening and shaping it to be slightly wider towards the top. Think kite. Each petal is shaped roughly into the diamond shape of a kite. If you are having difficulties with the shape of the petal, look at real sunflower petals and mimic that petal shape here. I did not flatten the outer edges of the petals. Next, add 2-3 vertical lines to each petal to give it texture. For an added effect, pinch the petal tips together to form a point. This is optional, but I prefer the look of them pointed. You can see both options in the picture below. Now it is time to add the brown fondant centers you created. Add a touch of water to the yellow fondant and then place the chocolate fondant center in the middle of the sunflower. Form another set of petals just like the first set. While working on the second set of petals, Rest your sunflower upside down on a flat surface. After pinching the petals into points, attach the second set of petals onto the back of the first set. Use a little water in the center of the flower to stick the fondant together. Arrange the petals so that they alternate and none of the back petals are hiding. I forgot to take a picture of this step (oops!) But you can see the alternating pattern on the finished sunflower shown below. Rest the sunflower upside down on a flat surface. Add a floral wire now will the fondant is soft. This will be used to stick the sunflower to the cake later on. Let the fondant dry until hard. How long it takes to dry will depend on your environment. However, it is best to plan for 2 days of drying time. Make them in advance and make extras in case petals break during assembly or transporting. After the fondant has completely hardened, add a little color to make the sunflowers pop. I used orange luster dust. Using a dry paintbrush, add the dust to the base and center of the flower petals. Be careful because a little goes a long way! This gives the sunflower an eye catching yet natural glow. Now it is time for assembly! 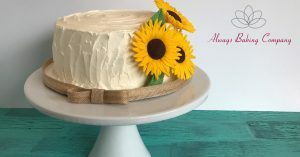 Arrange your sunflowers on a freshly frosted cake. I used a textured cake with a swirl on top to give the cake a rustic feel. For some extra flair, you can also add some green leaves (but be sure to make these in advance too!) Play around with the arrangement to see what looks best on your cake. Have any questions about the technique? Post your questions below! And please, do me a favor and let me know if you tried this technique and if you found it to be the easiest way to make a sunflower.